We are proud to announce the 2009 AICUO Award for Excellence in the Visual Arts Grand Award winner and People’s Choice Award winner. 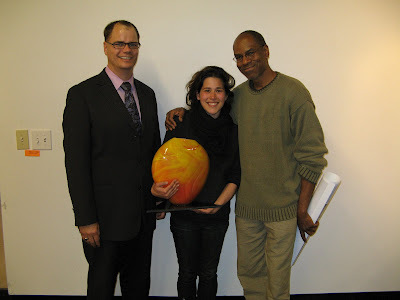 This year’s Grand Award was presented to Amy Giovanna Rinaldi from Oberlin College. The People’s Choice Award winner was Mary Griffith from Wittenberg University. As the Grand Award winner, Amy Giovanna Rinaldi will receive a $2,500 cash prize and AICUO will purchase one of her pieces to display in our office. Held at the Columbus College of Art and Design (CCAD) Canzani Center, the second annual AICUO Award for Excellence in the Visual Arts reception was held on Monday, April 20th to recognize the six AICUO Award winners for their outstanding achievements in the arts as well as all the students nominated for this award by their institutions. Preceding the reception a student panel was held, moderated by CCAD professor Robert Robbins, allowing the students to discuss in a candid manner their inspiration, goals, achievements, and current works. 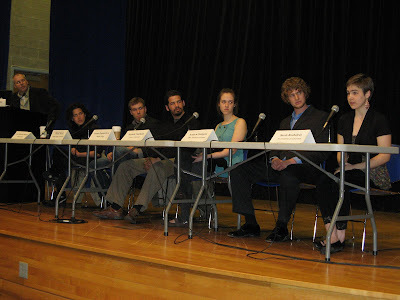 The panel was attended by art faculty, students, and the artists’ families. At the reception, the artwork created by the six winners was shown throughout the evening in a streaming PowerPoint for those in attendance to view their portfolios and start conversations with the artists about their pieces. Each winner was introduced by a member of their art department and presented commendations from their legislators as well as original blown glass awards, designed and created by local artist Jason Antol, who is a graduate of CCAD. This year’s AICUO Award winners were: Mark Bush from Columbus College of Art & Design; Antonio Papania-Davis from Oberlin College; Sarah Rocheleau from Art Academy of Cincinnati; Andrew Steingass from Ohio Northern University; and Nathalie VanBalen from Denison University. In its second year, the AICUO Award for Excellence in the Visual Arts is an exciting way our Research Foundation is recognizing the unique talents of graduating artists from Ohio’s independent colleges. This year, twenty-one artists were nominated for this prestigious award. To see their works, visit our Web site at www.aicuoartaward.com.